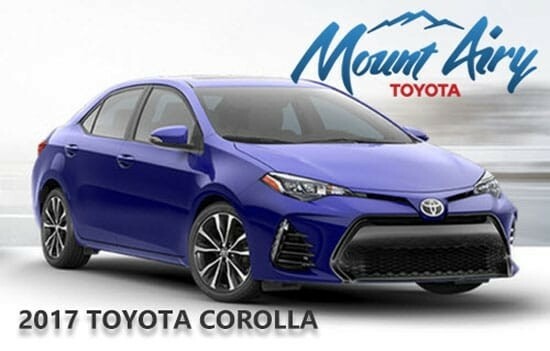 The brand new 2017 Toyota Corolla LE Sedan and the 2017 Toyota Corolla IM Base Hatchback are now available and waiting for you at Mount Airy Toyota. The Toyota Corolla has been the practical, affordable, and reliable vehicle of choice for 50 years with over 40 million vehicles sold. Why does generation after generation stick with the Toyota Corolla? It’s quite simple. For 50 years, families after families have felt safe and secure driving the Toyota Corolla. The 2017 model offers that safety and security. The 2017 Toyota Corolla comes equipped with Toyota Safety Sense, a safety package that includes Pedestrian Detection, Lane Departure Alert with Steering Assist, Pre-Collision System with Pedestrian Detection, Dynamic Radar Cruise Control, and Automatic High Beams. The Pre-Collision System and Pedestrian Detection scan for cars and pedestrians and alert the driver if a collision may be forthcoming. The Lane Departure Alert with Steering Assist provides corrective steering if needed to insure the Toyota Corolla does not drift too far into an adjacent lane. With the 2017 Toyota Corolla, there is no more forgetting to switch off the high beams when oncoming, nighttime traffic heads your way. The Corolla’s Automatic High Beam safety measure detects the oncoming traffic and makes that switch automatically for you. The 2017 Corolla’s Dynamic Radar Cruise Control allows you to maintain a preset following distance and will adjust the speed for you when using the cruise control option. The 2017 Toyota Corolla is a handsome compact vehicle. It offers a redesigned, sporty front fascia for the SE model, enhanced by the stylish Standard Bi-LED headlights and a rear spoiler. 17-in alloy wheels are also available to sportify your 2017 Corolla. The Toyota Corolla has been praised over the years for its roominess that is comparable to mid-sized sedans of just a few years ago. At 183 inches, the Corolla offers comfortable legroom for four passengers. The Toyota Corolla also provides spacious cargo space due to its foldable back seats. SofTex-trimmed seats are available for those who appreciate a leather-like surface that are resistant to water and stains. The 2017 Toyota Corolla is a gas-friendly vehicle perfect for Charlotte area commuting. It gets an EPA-estimated 40 miles per gallon on the highway and 30 for city driving. Not in the mood for the brand new Corolla? Not a problem. Now is the perfect buying time for the 2016 Toyota Corollas. Mount Airy Toyota offers great deals during the fall and winter months for 2016 and older models to make room for the 2017 models. The 2016 Toyota Corolla L Sedan, the 2016 Toyota Corolla LE Sedan, and the 2016 Toyota Corolla S Plus Sedan are all available at Mount Airy Toyota.